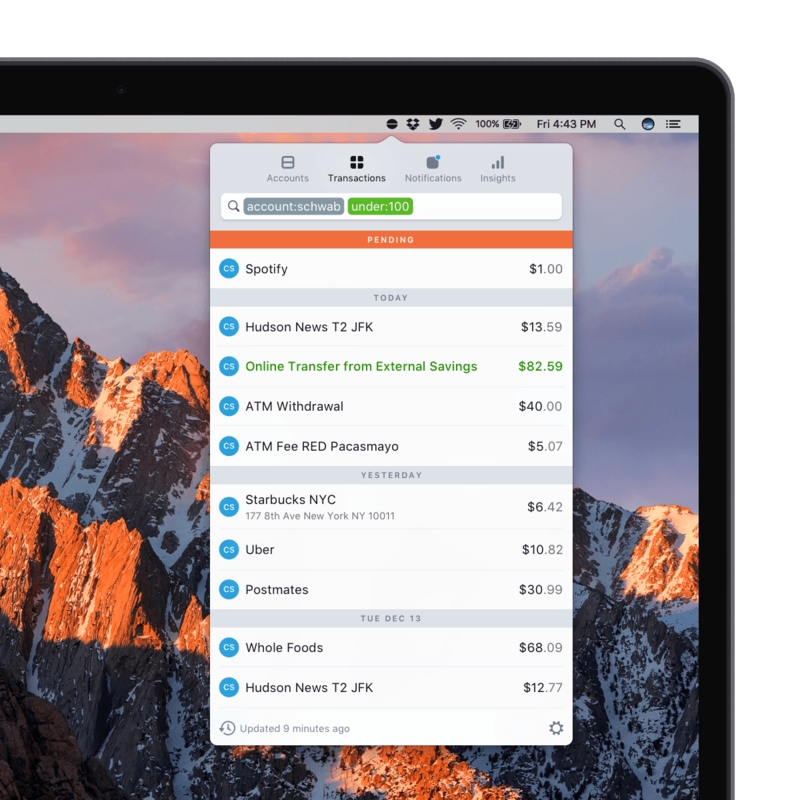 Balance is a macOS menu bar app that tracks the balances and transactions in your bank, investment, and online financial accounts. 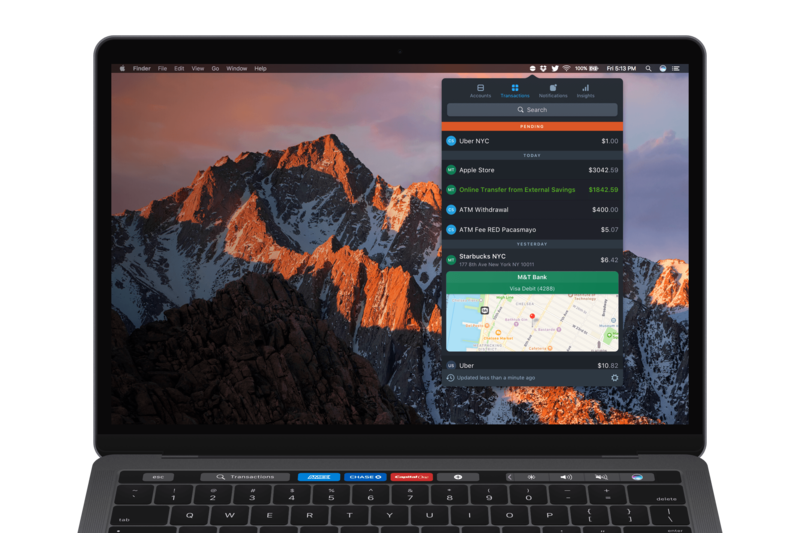 The app supports thousands of financial institutions and takes advantage of some of Apple’s latest innovations on the Mac like the Touch Bar and Touch ID. If you want immediate access to balance and transaction data across multiple accounts at your fingertips, Balance is worth a look. To add an account to Balance, click one of the major financial institutions listed in the drop-down window when you click on the menu bar icon, or search for another from the search box at the top of the window. When adding your login credentials for a financial institution, there is a helpful 1Password button that kicks off a search for any related passwords you have saved. Unfortunately, it only uses the first word in the name of the institution you pick so clicking the 1Password icon for ‘Bank of New York’ will only search 1Password for ‘Bank,’ which could return multiple results depending on your 1Password database. At the bottom of the login screen is a button with a disclosure arrow that expands the window to reveal an explanation of the security used by Balance. According to the description in the app, Balance uses a service called Plaid.com. Your banking login credentials are not sent to Balance. They are transmitted by SSL to Plaid, which provides a read-only copy of transactions to Balance. Plaid has direct relationships with financial institutions and is used by companies like PayPal, Venmo, and Stripe. I took a look at Plaid.com before entering my banking login credentials into Balance and got comfortable with the security involved, but I encourage you to do the same before trying Balance because everyone’s tolerance for risk is different. I logged into an investment account, which has sub-accounts, a checking account, a credit card account, and a PayPal account. Balance immediately downloaded transaction data for each account without a hitch. Balance is divided into four tabs across the top of the window: Accounts, Transactions, Notifications, and Insights. Accounts lists each account by financial institution with a total balance at the bottom of the window. Clicking on an account lets you search for transactions related to just that account in the Transactions tab. It is my understanding that a filter system that makes these search tokens more discoverable should be released soon as part of an update to Balance. 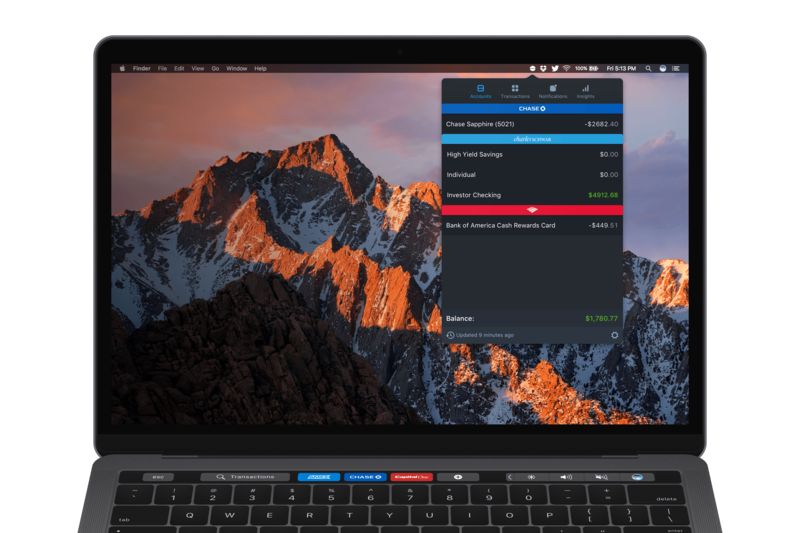 Transactions and accounts can also be navigated with the Touch Bar if your Mac has one. Notifications lets you set up rules that will send you an alert when actions occur. For instance, you can set up rules to notify you when a transaction occurs that is over a certain amount or is labeled with a particular category. Insights has two ways to filter transactions. You can view transactions with new merchants or all transactions by merchant. If you add multiple credit and debit cards, Insights will give you a better idea where you are spending the most and new vendors you have frequented even if the charges are spread across multiple credit or debit card. One thing that I’d like to see added to Balance is an option to break the window away from the menu bar like Fantastical for Mac does. That would make it possible to use Balance side-by-side with a spreadsheet or other app. The trouble with being strictly a menu bar app is that Balance’s window disappears every time you switch to another app. Balance is a good solution if you want to frequently check your account balances and transactions because it’s always at your fingertips in the menu bar and up-to-date thanks to background updates. Balance may also work well for small business owners who need to keep tabs on the use of company credit cards by multiple people. By using Plaid as an intermediary with financial institutions, Balance brings together disparate sources of data into one unified, well-designed, secure, and organized view that saves you the time of checking the websites of multiple institutions. Balance is a free download on the Mac App Store with In-App Purchases of subscriptions that are priced based on the number of accounts you want to track. Five accounts cost $4.99 per month or $49.99 per year; ten accounts is $9.99 per month or $99.99 per year; and twenty accounts is $19.99 per month or $199.99 per year.